Hey foodie peeps. It’s been a while and we’ve missed sharing our stories and recipes with you. One last special outing to cap off the summer. I think in the past we’ve mentioned our annual visit to our friends’ cottage. We met this wonderful family years ago, and we hit it off right away. They have generously invited us to their beautiful piece of paradise for the past 5 years. We’ve thoroughly enjoyed capping off the summer with our Labour Day cottage weekend on the lake. As always, the weekend did not disappoint! We relaxed, fished, played music, went boating, ate well, and best of all, got to spend time with these amazing friends. This is a highlight of our summer every year. We had such a great summer, but we all know what comes at the end end of summer… school! The kids weren’t that excited about going back to school, but thankfully, they’ve had a great start to the new school year. Our little guy thinks his teachers are awesome and he’s started to make some new friends. Our older guy started college this year (yup, we’re getting old). He wasn’t super excited leading up to day one, but he’s absolutely loving it now. He’s in a marketing program and enjoying all his classes and meeting new people. End of grilling season? I think not! Many people consider Labour Day weekend the end of summer; time to swap out shorts and tees for jeans and cozy sweaters, and sadly, put away the patio furniture and close up the outdoor grill. Well, this doesn’t apply at our home. Frankly, I could wear shorts most of the year, and I definitely use our barbecue year-round. I may change some of the types of food I’m cooking, but I won’t stop grilling. This year I’m especially excited about cooking outdoors since we’ve partnered with our friends at Broil King. Our Baron™ S590 has been such a pleasure to cook with. This barbecue is exceptionally well-built. Before having this new Broil King Baron™ S590 I had never cooked using rotisserie before. I must say, it’s one of my favourite ways of cooking, and I’m thrilled that I can do it at home now. It’s mesmerizing to watch food rotate to juicy perfection while achieving a beautiful golden colour as it slowly rotates. This is my kind of meditation. Rotisserie Porchetta… It’s good. Yes it is! 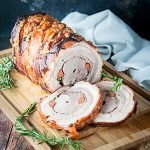 I had been thinking about making porchetta for a long time! It took a bit of research because I wanted to make sure I could achieve that perfect crackly skin while keeping the meat tender and juicy on the inside. Timing and temperature are key for this recipe to turn out perfect. The porchetta cooks slowly with indirect heat to melt the fat on the pork belly, making the meat buttery tender. The last 40 minutes are cooked with the addition of the back burner to achieve delicious crispy skin. 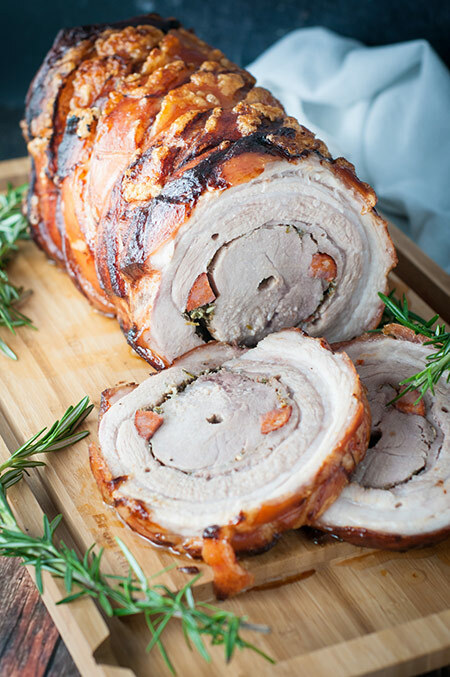 Our version of porchetta also includes Portuguese chouriço, adding a nice smokey flavour and our own Portuguese twist on this traditional Italian dish. I’m still salivating after last night’s dinner. Hey… it’s grilling season (always). Don’t let cooler temperatures deter you. Put on some warm clothes and fire up your grill. Spin yourself something delicious, and eat well, friends! 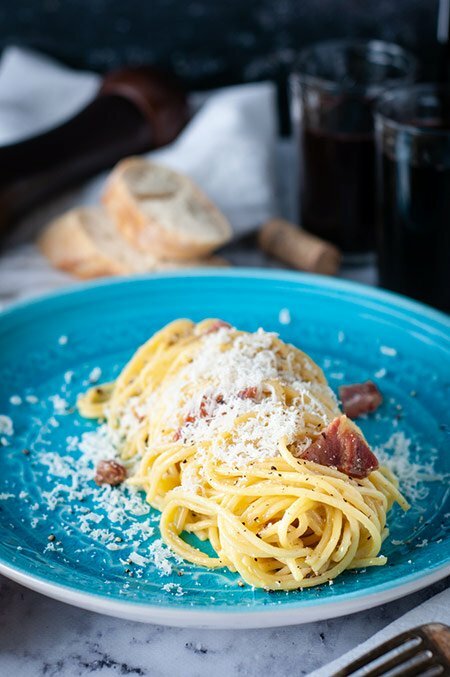 orchetta is a staple food of Italian cuisine. It’s prepared differently from region to region. This is our Portuguese take on this delicious dish. 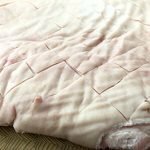 Place the pork belly on a clean work surface, skin side up and dry the skin with a paper towel. Run a sharp knife in diagonal lines across the pork belly about 1 inch apart. Careful to keep the cuts just at the surface of the skin and not cut too deep. Repeat the previous step across the first cuts to create diamond-like shapes in the skin. Our cuts (in the picture) were a little deeper than they should have been. Flip over the pork belly and make a few shallow cuts into the meat. Sprinkle 2 1/2 tbsp of flaked salt and all the black pepper evenly over the meat side of the pork belly. In a small bowl, mix together 3 tbsp of olive oil, rosemary, sage, fennel seeds, crushed red pepper, garlic and lime zest. Spread the mixture over the pork belly evenly and press down with your hands to make sure the entire pork belly (meat side only) is well coated. Place the pork loin across the middle short end of the pork belly (on the meat side). Cut the chouriço in half length wise and place the two pieces on the pork belly, on both sides of the pork loin. Wrap the pork belly around the pork loin as tight as you can to form a roll. 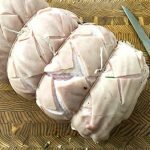 Use butcher's twine to tie up the porchetta, the string should be about 1 1/2 inches apart. The step is best done with someone's assistance if possible. Rub the last tbsp of olive oil over the pork belly skin. Rub in the last tbsp of flaked salt over the pork belly skin. Place the porchetta on the rotisserie spit as per the manufacturer's instructions. 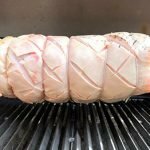 Place a drip pan (just a little wider than the porchetta) on the heat covers of your grill just under the grates/grids and add a couple of cups of water. This creates indirect heat for cooking the porchetta. Heat the barbecue to 325 ºF. To accomplish this on our grill (Broil King Baron S590), we left the centre burner off and turned on the other 4 burners on their lowest setting. Every barbecue will perform slightly different, so make sure to read your manufacturer's instructions. Once the barbecue reaches 325 ºF, place the spit on the rotisserie unit, set it to rotate and close the lid. Cook for about 2 hours and 15 minutes, or until the internal temperature is 120 ºF. Turn the back burner on between medium and medium high and continue to cook the meat with the lid closed. The barbecue should reach about 400 ºF. Adjust the temperature if needed by reducing the back burner power. After about 30 minutes, the skin will look golden brown and bubbly. The bubbles on the skin are the sign that the skin is now crackly. Check the internal temperature. The temperature should be between 145 ºF and 150 ºF. Our porchatta took another 10 minutes cooking with the back burner on to reach this temperature (total of 40 minutes at the higher temperature). Remove the porchetta from the barbecue and spit, place it on a tray and cover it loosely with aluminum foil. Let it rest for about 15 minutes before cutting into the meat. Enjoy! On our last post, we featured a quick and easy homemade tomato sauce made in an Instant Pot. The beauty of having lots of tomato sauce is that you’re set for a variety of meals. You can make veal sandwiches, pizza, pasta and even fish. Today I decided to make easy three-meat meatballs. But aren’t meatballs a lot of work? Actually… they’re not! 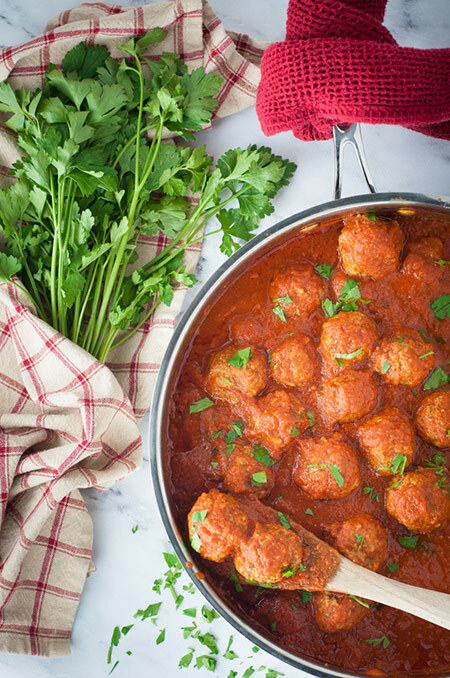 If you have a nice tomato sauce ready to go, the meatballs are easy and quick to make. Basically all the ingredients get tossed in a large bowl and then you roll the meat into balls. The formed meatballs then cook for about a half hour in the tomato sauce and voilà… home cooked meatballs! Cook up some pasta while the meatballs are simmering and you’ve got a whole meal ready to eat in no time. I appreciate knowing the ingredients in the food we eat, and I like controlling the seasoning and spices to our taste. And while I can’t always do homemade (because life, as you know, keeps us busy), it always feels so good when I can make homemade meals. 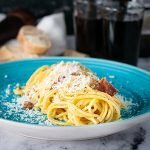 The truth is that many fresh homemade meals take no longer than the time it takes to go out to eat, or to pickup take-out, or to prepare a pre-packed frozen boxed meal… and it’s normally a less expensive and healthier option too. I’m sure you can find frozen meatballs that are quite good, but I’m confident that this recipe will stand up to them. The soaked bread keeps them moist and tender, and the variety of meat and spices makes them taste fantastic. That kind of quality and flavour doesn’t come from a box. In our house, we’re huge fans of Italian food, so these meatballs with our fresh homemade sauce, and fresh pasta were a no-brainer for us. It was an all thumbs-up kind of meal. 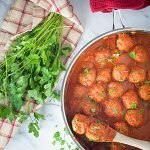 I encourage you to give this easy meatball recipe a try and see how easy it is to eat well, friends! They’re easy to make, they're tender, they're full of flavour and they’ll be perfect with your favourite tomato sauce. Delicious Italian cuisine. Place a large wide pan on the stove and pour in the tomato sauce. Heat the pan and sauce on medium. Use a small (or regular) food processor to tear apart the bread into very small pieces, like bread large crumbs. Place the shredded bread and milk in a small bowl and mix, to coat the bread completely. Let sit for 5 minutes. In a large bowl, place the ground meats, salt, ground pepper, onion, garlic, parsley, basil, olive oil and soaked bread pieces. Toss all the ingredients with your (washed) hands to mix well. Use a soup spoon or small cookie dough scoop to measure out potions of the meat mixture. Roll the portions of meat between your hands to form meat "balls". Place each meatball in the sauce while forming them. It might feel like a tight squeeze by the end, but don't worry, they'll shrink a bit while cooking. Once all the meatball mix is used up and all the meatballs are in the sauce, raise the heat to medium high until the sauce starts to boil/bubble. Lower the heat to medium and cover. Cook / simmer for 30 minutes. Your meatballs are ready to serve with your favourite pasta, in a sandwich or on their own as an appetizer.